Last week, news surfaced that popular drugstore Rite Aid was disabling support for NFC and Apple Pay in its retail stores and over the weekend, CVS followed in its footsteps. Apple has now commented on the situation, telling Business Insider that it's working to get as many merchants on board with Apple Pay as it can. Both CVS and Rite Aid are members of Merchant Customer Exchange or MCX, a team of retailers that are designing their own payments system to compete with Apple Pay. Headed up by Walmart, which has also publicly stated that it won't be supporting Apple Pay, MCX is composed of several different retail outlets and restaurants, including Best Buy, Lowe's, Old Navy, Southwest, Target, 7 Eleven, Dunkin Donuts, Hobby Lobby, and more. MCX's payment solution, CurrentC, is currently in testing in Minnesota and takes a decidedly different approach to mobile payments. CurrentC does not use NFC, instead basing payments around the scanning of QR codes with a smartphone camera. CurrentC is highly beneficial to merchants, but appears to be of questionable value to customers given that it requires both a social security number and a driver's license number, along with access to a bank account. Despite only being available in Minnesota at the time being, MCX's CurrentC app has received hundreds of negative reviews from Apple Pay supporters. Android and iOS users on reddit have also teamed up to call for a boycott on all MCX partners, as disabling NFC support to prevent Apple Pay purchases also disables Android-based payment solutions like Google Wallet. Though quite a few big name retailers have opted out of Apple Pay, Apple has signed on with several major partners including Macy's, Chevron, Disney, McDonald's, Nike, Petco, Whole Foods, and more. 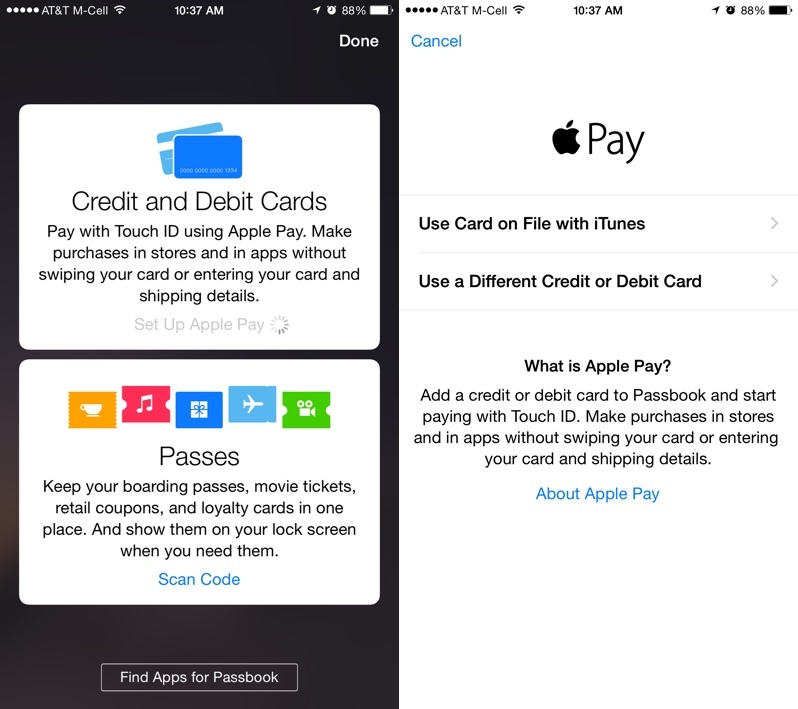 Apple Pay is accepted at the retail stores of any of its partners, and at any store that accepts NFC payments. Update 6:55 PM PT: Walmart, one of the major retailers behind MCX, has given Business Insider a statement on why it has opted not to accept Apple Pay, stating that it believes merchants are in the "best position" to create a mobile payment service for consumers. QR codes. Talk about skating to where the puck is instead of where it will be. P.S. Maybe, to ensure compatibility, we'll be asked to install a program using 8" floppies, Oregon Trail style. CurrentC looks stupid as far as user-experience goes. Doesn't Apple have a policy of not allowing apps that compete against their products? Apple should just straight up disallow that CurrentC app from their App store. It's incredible how bad some companies are at design.. how could any adult come up with something as horrible as CurrentC? Are these companies run by trained monkeys? I actually laughed out loud when I got to the bit about giving them your SS number. That's fine. I'll take by business elsewhere. CVS/RiteAid/WalMart/Etc. Most of the MCX members will accept Apple Pay as early as they can. Possibly earlier if they can figure out a way to break the agreement. Giving your driver's license number, social security number, and checking account number to merchants who have repeatedly had their mobile payments systems hacked with customer information stolen...brilliant. They'll have to hire police to stop the stampede of people trying to sign up for CurrentC. It's only a matter of time. They can't decline money for too long.